The United States Air Force's 341st Missile Wing is an intercontinental ballistic missile unit headquartered at Malmstrom Air Force Base, Montana. 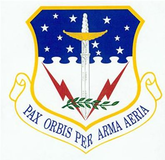 Up until 1 July 2008, it was designated as the 341st Space Wing. Established as a World War II Tenth Air Force North American B-25 Mitchell bomb group in India, the unit served as part of Strategic Air Command during the early part of the Cold War as a Boeing B-47 Stratojet wing, before becoming an intercontinental ballistic missile unit in 1962. Today, the 341st is one of three remaining United States Air Force wings that maintain and operate the LGM-30 Minuteman III intercontinental ballistic missile. The 341st Missile Wing reports directly to Twentieth Air Force, F.E. Warren Air Force Base, Wyoming, and is part of Air Force Global Strike Command, headquartered at Barksdale Air Force Base, Louisiana. The 341st Missile Wing is made up of a wing staff and five groups - the 341st Operations Group, 341st Maintenance Group, 341st Mission Support Group, 341st Security Forces Group and 341st Medical Group. The base is also host to two tenant units, the 819th RED HORSE Squadron and the 40th Helicopter Squadron (part of the 582d Helicopter Group). The 564th Missile Squadron served with the wing from 1967–2008. The 341st Missile Wing has its origins in the China-Burma-India Theater of World War II, being activated in India on 15 September 1942. 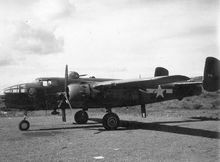 The unit was one of the first bomber units in the CBI; being equipped with B-25 Mitchell medium bombers which were shipped from the United States to Karachi. The aircraft were readied for flight operations by Air Technical Service Command at Karachi Air Depot and dispatched to Chakulia Airfield, now in Bangladesh in December. The group was formed with two bomb squadrons (11th, 22d) which had been attached to the 7th Bombardment Group since May 1942, and two newly activated squadrons (490th and 491st Bombardment Squadrons). The 11th Bombardment Squadron was already in China, having flown combat missions with China Air Task Force since 1 July 1942. Planes and crews of the 22d Bombardment Squadron had been flying recon and tactical missions over north and central Burma, also since July. The 341st Bomb Group usually functioned as if it were two groups and for a time as three. 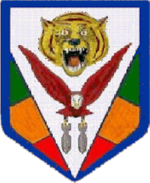 Soon after its activation in September 1942, 341st Bomb Group Headquarters and three of its squadrons, the 22d, 490th and 491st, were stationed and operating in India under direction of the Tenth Air Force, while the 11th Squadron was stationed and operating in China under direction of the "China Air Task Force", which was later reorganized and reinforced to become the Fourteenth Air Force. Fourteen months later the group headquarters along with 22d and the 491st Squadrons joined the 11th Squadron under the command of 69th Composite Wing, Fourteenth Air Force. 341st Group HQ was Kunming and the 22d and 491st were at Yangkai, while the 11th continued to be based at Kweilin, attached to the 68th Composite Wing. However, the 490th "Burma Bridge Busters" remained in India, under the command of Major-General Howard Davidson's Tenth Air Force. Still later the 11th Squadron and a detachment of the 491st operated for a time under the East China Task Force. Reactivated in September 1955 at Abeline Air Force Base (later Dyess Air Force Base), Texas as a Strategic Air Command Boeing B-47E Stratojet unit which were designed to carry nuclear weapons and to penetrate Soviet air defenses with its high operational ceiling and near supersonic speed. The 341st flew the B-47 in training missions and participated in various SAC exercises and deployments with the Stratojet to bases in Morocco and England designed for forward deployments. Also controlled a KC-97 Stratotanker squadron to provide air refueling for B-47 operations. In 1958 after the loss of some aircraft in clandestine Cold War operations; it was believed that Soviet air defenses had caught up to the ability of the B-47 to successfully penetrate Soviet airspace if called to combat duty. The Stratojet began to be phased out of the inventory and the 341st Bomb Wing began sending its aircraft to storage at Davis-Monthan AFB in 1961. The unit was inactivated on 25 June. On 15 July 1961 the 341st was reactivated as the 341st Strategic Missile Wing. A year later, in late July 1962, the first LGM-30A Minuteman I ICBM arrived at Malmstrom and was placed at Alpha-9 launch facility. The 10th Strategic Missile Squadron (SMS) accepted its final missile on 28 February 1963. Two months later, the 12th SMS became 100 percent combat ready. In July, the 490th SMS became fully operational, giving the 341st SMW responsibility for 150 silos. In August 1964, the Air Force announced plans to build an additional 50 silos assigned to the 341st to house LGM-30F Minuteman II missiles. As construction of these new silos proceeded through 1966, the 564th Strategic Missile Squadron stood up on 1 April 1966. Just over a year later America's 1,000th Minuteman missile would be in place and on alert at Malmstrom. This milestone marked the completion of Minuteman deployment by the United States. While new Minuteman IIs deployed with the 564th, upgrading of the Minuteman I models had been ongoing with the wing starting a transition from "A" to "B" models in August 1964. By June 1969, all Minuteman Is, both "A" and "B" models, were replaced by Minuteman II models. In 1975, the 564th SMS switched from the Minuteman II to the LGM-30G Minuteman III model. On 28 September 1991, President Bush ordered all Minuteman IIs off alert status. This order affected three-quarters of the 200 ICBMs assigned to the 341st SMW. On 1 September 1991 the 341st SMW was redesignated simply a Missile Wing, part of Strategic Air Command's Twentieth Air Force. As such it apparently became the only formation designated a 'Missile Wing' ever assigned to SAC. 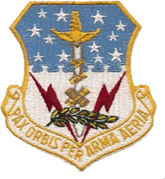 The 341st Missile Wing was reassigned from SAC to the Eighth Air Force of Air Combat Command on 31 May 1992. In accordance with the Strategic Arms Reduction Treaty (START), on 28 September 1991, the 341st Missile Wing began taking its Minuteman IIs off alert and began deactivation of the missiles. 150 Minuteman II missiles were removed from their silos. Fifty of the vacated silos received Minuteman III missiles, joining the 50 Minuteman III missiles already on alert status. This conversion was completed by 1994. On 1 December 2009 it was reassigned to the new Air Force Global Strike Command where it remains on duty 24 hours a day, 7 days a week, every day of the year. In November 2008, the wing failed its nuclear surety inspection, given by the Defense Threat Reduction Agency. The wing again failed the inspection on 9 February 2010. A July 2009 inspection conducted by the Air Force Audit Agency found that 48 percent of the 711 unused nuclear weapons-related materials handled by the wing were incorrectly tracked or recorded. The inspectors primarily faulted the Material Command, not the wing, for most of the discrepancies. In response to the findings, the wing moved all unused nuclear-related items to a secure storage area and performed a follow-up inventory which accounted for 100 percent of the items. Westover Field, Massachusetts, 27 December 1946 – 27 June 1949. ^ a b c d e f g h Kane, Robert B. (6 April 2012). "Factsheet 341 Missile Wing (AFGSC)". Air Force Historical Research Agency. Retrieved 8 February 2017. ^ Strotman, Tony (2012). "Web Home of the 341st Bomb Group". usaaf-in-cbi.com. Retrieved 8 February 2017. ^ "Library: Factsheets: 341st Missile Wing". 341st Missile Wing Public Affairs. 1 October 2015. Archived from the original on 13 March 2016. Retrieved 8 February 2017. ^ Rowell, Jenn (19 April 2016). "Allen assumes Malmstrom command". Great Falls Tribune. Retrieved 25 July 2016. ^ Shane, Leo III (17 December 2008). "Report: Unit Fails nuke security inspection: Failure is Air Force's third so far this year at nuclear weapons". Stars and Stripes. Retrieved 8 February 2017. ; Gertz, Bill (4 February 2009). "Exclusive: Air Force fails new nuclear reviews". The Washington Times. Retrieved 8 February 2017. ^ Hoffman, Michael (24 February 2010). "2 Malmstrom units fail nuke inspections". Air Force Times. Archived from the original on 22 July 2012. ^ Rolfsen, Bruce (1 March 2010). "Nuke audits uncover shortfalls at 5 bases". Air Force Times. Archived from the original on 31 July 2012. ^ Starr, Barbara (23 August 2013). "Air Force nuke unit fails inspection". CNN politics. Retrieved 8 February 2017. ^ "Malmstrom nuclear missile wing fails inspection". Air Force Times. 13 August 2013. Archived from the original on 13 August 2013. Retrieved 8 February 2017. ^ Everstine, Brian (15 January 2014). "34 nuclear missile officers implicated in cheating investigation". airforcetimes.com. Air Force Times. Archived from the original on 15 January 2014. Retrieved 15 January 2014. ^ Harper, Jon (27 March 2014). "9 nuclear missile wing leaders fired; commander resigns". Stars and Stripes. Retrieved 8 February 2017.